Click on the tab of the course site that you’d like to populate with Moodle course content. 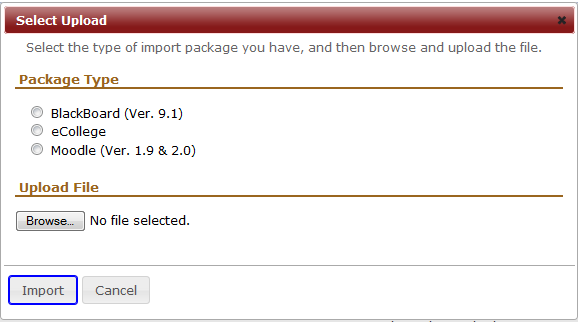 Select Moodle from the options. This may take several minutes to complete, depending on the amount of data you had in your Moodle course and the speed of your network. Do NOT close the window during this process. Wait for the confirmation message that the operation was successful. You are now ready to review your content closely and make adjustments to instructions or references that were specific to Moodle. Check your content in all areas of Etudes: Announcements, Syllabus, Modules, Assignments, Discussions, and Resources.